the Northern Worker: A Better World is Possible! 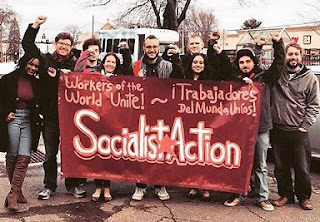 The socialist vision is for a world based on peaceful collaboration and international cooperation of working class people — not the exploiters who rule today. Socialists call for the common ownership of the world’s resources, with their use and distribution under the democratic control of the world’s peoples. Socialists strive to create an egalitarian and democratic government, organized and controlled from the bottom up, which facilitates people’s active participation in making decisions about how society is run. Socialists are for the protection of the world’s ecological systems, and for putting science to work to sustain life, rather than destroy it in the pursuit of profit. We strive to create a society where human relations are based on respect, equality and dignity of all peoples, not the racism, sexism or homophobia that permeates capitalist society. -How Do Socialists Propose to Win? -For a Shorter Work Week With No Loss in Pay! -What Is a General Strike? -What Kind of Third Party Do We Need? -The Forging of Oppressed Nationalities in the U.S.